Today is Christmas Day in Cerro Azul! The sunshine is strong and the blue sky has only the odd low hanging white cloud racing across the sky toward Panama City. The breeze is gentle and pleasant. Temperatures are in the low 20C. It is about as perfect as weather here can be. Our plans today include an expat potluck brunch at Smitty and Rachelle’s house. They are long time permanent residents of our community and this is a usual event for them to host at Christmas. We arrived at around 10AM and watched the group grow over the next hour or so to around 16 people. Everyone brought something “interesting” to add to the menu. Smitty is one of the more knowledgeable people up here when it comes to critters! If it is a bug, plant, bird, snake, caterpillar, or some other living creature or you want to know how to attract or get rid of, he is your knowledge base. He and Rochelle have a couple of critter cams that they deploy from time to time to see what is going on when they are not around. They say that you should never do this unless you are prepared to see what runs around here in the night! Here is a tip from Smitty! When you go on a hike, always take a camera because if a snake bites you, you will need a picture to show the hospital so they can tell what variety it was! Enough of that! Smitty had to show me the fourth generation of a bug that lives on one of his trees. The little green stick will eventually mature to become just like the one in his collection. We enjoyed visiting with our neighbours for Christmas morning and the food was great! 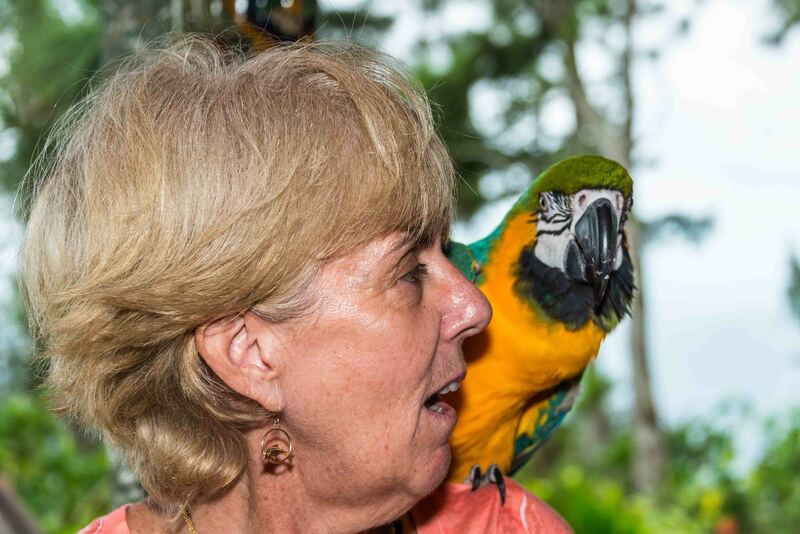 The event was held on Smitty and Rachelle’s big open deck, which is a perfect place to see wildlife, particularly if you like hummingbirds and their relatives. They have a number of hummingbird feeders deployed in a group at the edge of their deck. The activity around those feeders is incredible. At times, there are dozens of birds at those feeders. They have been doing this for so long that their house is on the migration path for hummingbirds migrating south to South America. They are amazing little creatures and quite aggressive when they need to be. We were told that they run on a boa constrictor that got too close! 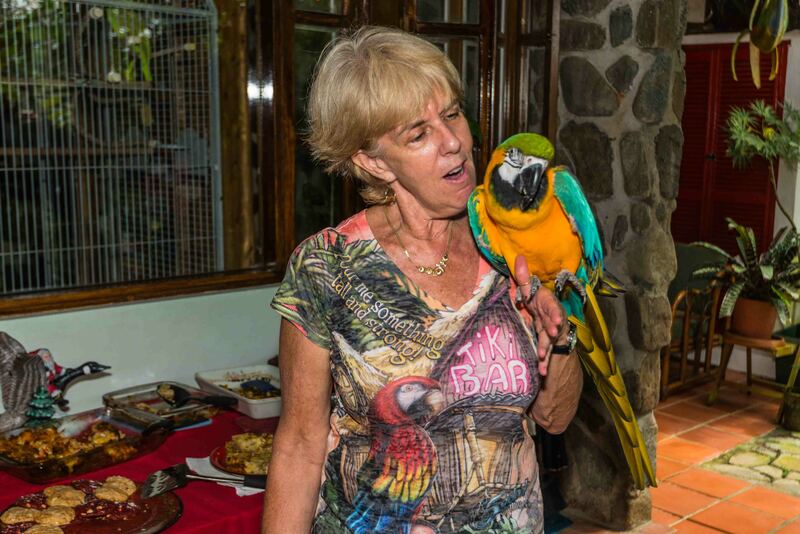 Our hosts own some exotic birds here in Panama. Morgan, a McCaw that they brought with them from the US, is the only bird that actually has a passport. There are also a couple of very talkative Parrots. Three Australian Sheep Dogs, and some cats. They have quite the menagerie! Oh, I mentioned “creative” things for brunch… How about a vegetable house? Yes, one of the guests, an Engineer (surprise, surprise), actually built and brought a vegetable house. How many of you have seen a real vegetable house? I am told by a reliable source that she actually used a ruler and everything to make sure it worked out. Anyways, I hope your Christmas was as enjoyable as ours was, here in the tropics. Our next event will be an expat New Year’s eve party that, if the weather cooperates, will give us a nice view of some of the fireworks in Panama City.